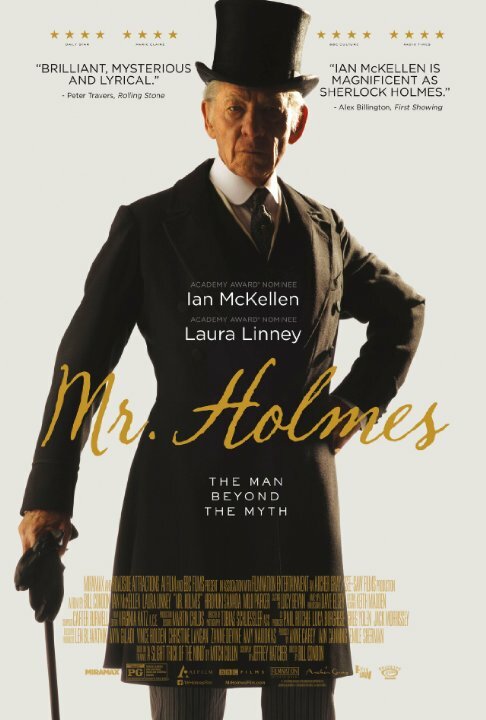 PLOT: An aged, retired Sherlock Holmes, deals with his failing mind, as he tries to remember his final case and the memory of a woman who still haunts him. He befriends a fan, the young son of his housekeeper, who wants him to work again. I am a huge fan of Sherlock Holmes and have enyjoyed many interpretations of the singular detective, from the authentic period retellings of the 1880s up until the Great War, the many films adaptations starring the wonderful Basil Rathbone, the stunning performance by Jeremy Brett in Granada’s TV series, the quirky (but ultimately vapid) Downey Jr. movies and the delightful BBC modern day interpretations starring Benedict Cumberbatch (though much less so the US attempt with Johnny Lee Miller as the lead, Elementary). So when a truly original Holmes story was announced I was more than a little excited. Many of the previous Holmes franchises have placed a large emphasis on the character of Dr. John H. Watson. James Mason, John Mills, Robert Duvall, David Burke (one of my favourites), Dudley Moore, Jude Law, Martin Freeman and even Lucy Liu (as Dr. Joan Watson) have all played the part and brought something unique to the character. But Mr. Holmes is a movie that eschews the notion that Sherlock cannot be Batman without his Robin. In fact Holmes’ only real mention of his ex-partner is to decry the ‘penny dreadfuls’ that the good doctor made out of their much loftier work. 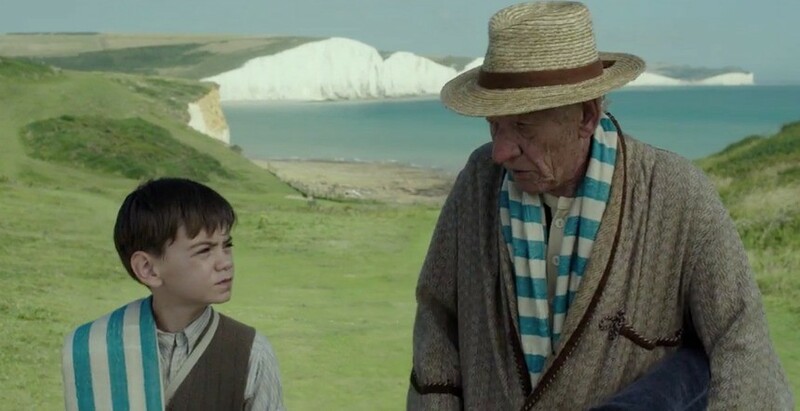 Set thirty years after Conan-Doyle’s books ended, McKellen plays a 93 year old curmudgeonly Holmes, living in near isolation by the cliffs of Dover, with only a dissatisfied housekeeper and her young son Roger to break up the days tending to his beloved bee colony. Holme’s mind is rapidly deteriorating and he has recently returned from a trip to Hiroshima in Japan where he would track down a herbal remedy that is believed to slow down the effects of memory deterioration. The ‘prickly ash’ he hopes will maintain his failing mind long enough to allow him to correct the sensationalised retelling of his final (and in reality unsolved) case ‘The Adventure of the Dove Grey Glove’ and leave a true legacy of Sherlock Holmes. Told in a series of flashbacks we hear the tale of Ann the twice miscarried and deeply depressed wife of a Holmes’ client Thomas Kelmot. We also follow the story of Tamiki Umezaki, a Japanese man desperate to understand why his father did not return home following a trip to England, abandoning Tamiki and his mother. Add to this his staid relationship with housekeeper Mrs. Monro and the hero worship from Roger and you have three gently interwoven stories that offer more heart than mystery, whilst still feeling every bit a true Sherlock Holmes tale. I haven’t read Mitch Cullin’s novel on which the film is based, but between Cullin, screenwriter Jeffrey Hatcher and director Bill Condon a truly singular (to use a term so often and so accurately used in Conan Doyle’s canon) interpretation of a remarkable character has been created. If this is the final tale of the world’s first super-detective, it is a fitting end to a most remarkable life. Despite the passage of time, McKellen’s Holmes seems far more authentic than any TV or movie adaptation of the last quarter century. A wonderful period drama about the future of a past icon.